Does the reality of BIM live up to the dream? How does the vision for BIM compare to the experience of implementing it on the ground? A case study in the field of student accommodation development. Building Information Modelling (BIM) uses collaborative model-based software to manage construction projects. A central model is produced which is a digital prototype of the completed building. Loaded with information about the qualities of the materials and operational requirements of the building, the prototype allows designs to be developed in the digital world to prevent mistakes being made in the real world. It also can provide a working model of the building in occupation – providing a dynamic manual for future operation and maintenance. The introduction of a BIM methodology to construction is resulting in radical changes to the industry, particularly in complex projects where there are heavy demands for coordination across disciplines. To an extent, BIM has been sold as a panacea for an industry which has a reputation for being confrontational and slow to modernise. How does this utopian vision of BIM’s capabilities compare to our experiences on the ground? This paper considers the benefits of using BIM software, and the processes that will help deliver true value to clients. It uses the case study of the University of the West of England’s Wallscourt Park student accommodation development. Willmore Iles Architects introduced BIM software to the practice in 2014. Although not ‘early adopters’, the practice was in the first wave of commercial practices to use BIM on a wide range of projects, not just large and complex schemes. The BIM approach is valuable throughout all work stages. It can be used as an interactive design tool for options appraisals as well as for project coordination and post completion asset management. It is possible through building modelling to improve coordination in the design, and across disciplines, reducing errors during construction. The BIM model can be loaded with data which can be manipulated for a variety of uses. This might be quantitative information for asset registers, maintenance regimes for digital operations manuals, or complex thermal and acoustic information for scenario testing. 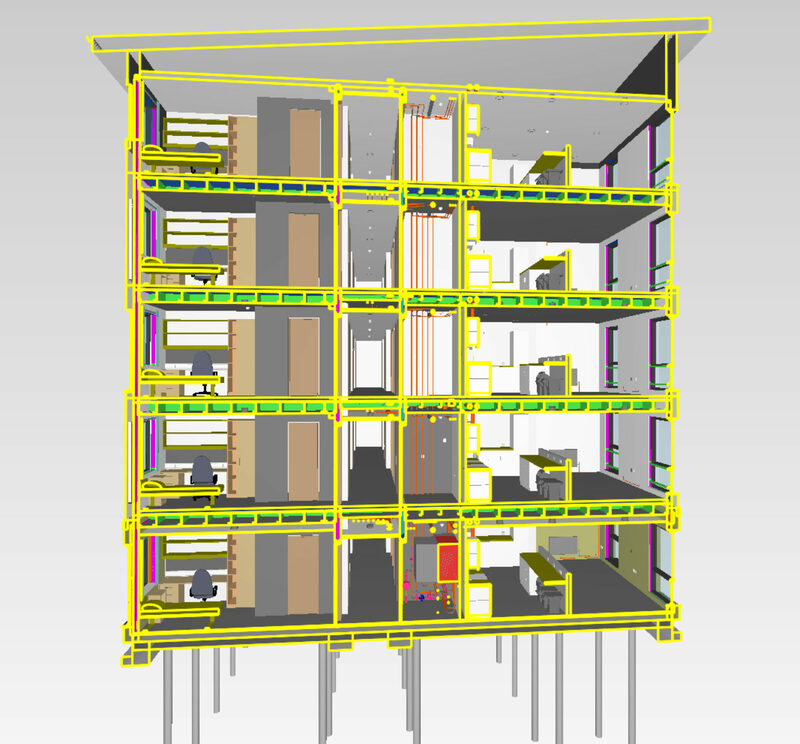 There are challenges and costs to adopting BIM software – in our case Revit. Formal training improves the learning curve – but the full transition to BIM takes time and resources. We are lucky enough to have a few advanced Revit users who have set the standards within the office and manage ongoing training requirements. An internal user group within the practice has been set up to pass on best practice and ensure conformity to standards. The following case study is a good example of how BIM is being adopted by clients in ‘the real world’. Whilst we still haven’t reached the level of maturity required across the industry to fully maximise the benefits of BIM, clients are beginning to see the impact of the BIM revolution. The University of the West of England’s Wallscourt Park II development comprises 561 student bedrooms arranged in five and six storey cluster flats, four storey townhouses and a four-storey studio block. It is the second phase of accommodation on the site, and although procured through a tender process, the original design team and contractor were largely carried across from the initial phase. Willmore Iles Architects were appointed to provide architectural services as lead designer, and act as BIM coordinator for the design team. The contractor, Interserve, performed the roles of BIM Manager and Information Manager. The project was procured in 2015 when BIM was the ‘hot topic’ within the industry. Most clients felt the pressure to adopt BIM protocols but had little experience of how to commission a project-specific BIM service. In common with other projects procured at the time, the client developed their requirements from a widely published paper on best practice. As such these were generic requirements for “BIM Level 2”, giving little consideration as to how the client might get the best from BIM or use the information produced. On selection as preferred bidder it was possible to interrogate these requirements in detail and tailor the BIM activities to meet the building type, operational requirements and project budget. Willmore Iles and Interserve were able to give examples of other similar projects which helped to set a reduced, project specific, scope through dialogue with the University. Through discussion it became clear that the University requirements for the post-completion BIM model were simple. The model would be used as a way-finding tool for maintenance staff and that COBie outputs were required to populate the University’s Computer Aided Facilities Management system (Archibus). The simple and repetitive nature of student accommodation makes the maintenance regimes relatively simple – albeit on a grand scale. The BIM model could therefore be simplified to reflect the client true needs. Like all endeavours, BIM projects need to be tailored to match the actual client needs and desired outcomes. Using generic specification are likely to result in additional fees and cost for no measurable client benefit. Since the completion of the Wallscourt Project, UWE have appointed additional BIM specialists to their estates team. The new roles will ensure that a project specific brief will deliver strategic benefits to the University. One of the big advantages of BIM is the ability to test designs and perform ’clash detection’ in the model – well before the first brick is laid. The coordination of mechanical and electrical services is one area where a collaborative approach around a shared model has massive benefits. The software can check that pipework doesn’t clash with steel beams – and will highlight any concerns to the model owner, that can then be rectified. Our experience is that M&E consultants have been slower to take up BIM modelling. This is further complicated by the industry practice of switching consultants between planning and detailed design stages of the project; and the subsequent risk of knowledge loss between parties. On this project the scope of service for the M&E consultants was reduced to save costs; with the BIM service in particular reduced to modelling only “typical” information with no data entry function. This ‘cost saving’ was taken without due consideration to wider project objectives (and without the knowledge of the design team). Although not an uncommon situation, this de-scoping of service resulted in poorer coordination, but more importantly additional costs to retro-fit the model data for handover and a delay in the production of the model for client records. The scope of BIM services has to be consistent across disciplines – united to deliver a specific outcome. Varying the service to achieve cost savings needs careful consideration. What appears to be a simple saving may be quickly lost when the wider deliverables for handover are considered. As the industry becomes more familiar with BIM protocols, determining the scope of service is likely to be placed in the hands of a specialist. This problem is going to become much rarer as the knowledge of BIM working matures and the value that BIM brings can be quantified. Product suppliers across the construction industry are providing components to sit within BIM models. These information rich components of the model are an invaluable resource to help building a comprehensive model. Where products are common and frequently used this system is working well. For more specialised or custom products there are fewer standard models available. At Wallscourt Park we were using off-site manufactured bathroom pods. Although the pod provider supplied us with detailed drawings and specifications, their contract did not include provision for preparing a data-rich BIM component. This was a missed opportunity – a client produced component would have been a valuable addition to the model and simpler to convert into the post completion operational model used for maintenance planning. This oversight increased the workload for consultants and was not the optimal workflow. The scope of BIM services needs to extend to key suppliers and not just the consultant team. As the BIM industry matures it will demand that specialist suppliers produce their information suitable for collaborative modelling. One of the greatest successes of the BIM modelling on this project was the efficiency of the clash detection. Repetitive elements of design – bedrooms, kitchens and risers were prioritised. Catching issues in these elements of the design can prevent costly repetitive mistakes on site. (Thankfully the scope of service for all consultants included the repetitive element of design). WIA were responsible for clash detection. We use Solibri as our model checking software and clash detection was carried out on the collaborative model. We can customise the rules for clash detection making the software even more intelligent. In addition to simple clash checking, we used Solibri to undertake checks on building regulations issues. Solibri produces a log of all potential issues and becomes a second pair of eyes when checking the design. Clash detection and automated model checking really works and will only become more sophisticated over time. An experienced architect is still needed to check drawings but Solibri is incredibly quick, efficient and accurate. The classification system used in generating the model is important if various systems and software packages are going to communicate effectively. The initial brief called for Uniclass 2.0 – however, UWE ran a bespoke classification system for their asset management that was used to tag physical assets (for example all fire doors have a unique code applied as a tag). BIM software has the capability of accommodating multiple tags on a single object – and for this project the two systems could have easily be run side by side. However, the briefing did not make this a requirement, and again a workaround was required to deliver the data outputs required upon completion. The BIM ‘guys’ need to be in the room! The briefing process needs to consider all stakeholders at all stages of the model, from inception to operation. Consideration needs to be given to future-proofing for future maintenance packages and any issues with legacy software. Legacy software will continue to be an issue for some time. University estates often operate multiple systems with different protocols. An early engagement meeting with stakeholders should be able to highlight potential issues for briefing – but to say it again, the BIM ‘guys’ need to be in the room when critical scoping decisions are made. Using BIM protocols delivers value to clients. In our experience architectural fees have not risen as a result of BIM being adopted, therefore the additional costs of software, hardware and training are being absorbed by the design team consultancies. The additional cost is in the requirement for a BIM coordinator – but this is a relatively small cost. So, designers are getting the efficiency benefits of integrated modelling software; and clients are getting the cost benefits of better coordination, quicker scenario testing and fewer mistakes being resolved on site. BIM is delivering value to the clients – and this value is only set to increase as the efficiencies of collaborative working increase with wider uptake across the industry and better use of BIM capability. Writing this paper has highlighted how quickly the issues around BIM are changing as it becomes widely adopted throughout the industry. Government procurement rules have challenged the contractors to take up BIM – and this has forced a rapid uptake across the industry. Fully coordinated models across all disciplines are now becoming commonplace. BIM capability is seen as a must-have for most consultancies and clients. We will see improved efficiency through software development and up-skilling which will start to deliver the open-data, collaborative and cooperative dream that is beginning to be realised. Early engagement and strategic definition is the key to delivering a successful BIM project. There also needs to be a will to pay for a bit of future-gazing. At the start of the Wallscourt Park project the brief for BIM was generic and lacked specificity. Through dialogue the BIM requirements were realised that benefited the project in construction and tailored the outputs to existing systems. UWE’s new BIM team are currently working towards creating a digital campus, with complete records of all their buildings across their many campuses. This strategic vision will deliver long-term benefits to the University. The ability to model in the digital world before implementing in the real world is here to stay. And the applications for this type of modelling are only limited by the imagination. Ben Murrell is an Associate at Willmore Iles Architects. As a project architect he has delivered student accommodation developments for the University of Exeter, University of Reading as well as UWE. Ben shares responsibilities for the implementation of BIM across the practice. Ben is a BREEAM Accredited Professional with a personal interest in sustainable architecture. Ben is the internal advisor for all sustainability issues within the practice. The University of the West of England’s Wallscourt Park Phase 2 development comprises 561 student bedrooms and was completed in the summer of 2017. It is the second phase of accommodation on the site, with an earlier scheme providing 396 bedrooms across 38 three and four storey townhouses. Phase 2 is arranged in 8 bed cluster flats, four storey townhouses and a four-storey studio block.